Version 9 also includes some exciting highlights that will make life easier for both you and your customers, including improvements to the 3dcart Online Store Manager admin dashboard, Google Address Autofill, and other quality-of-life adjustments. 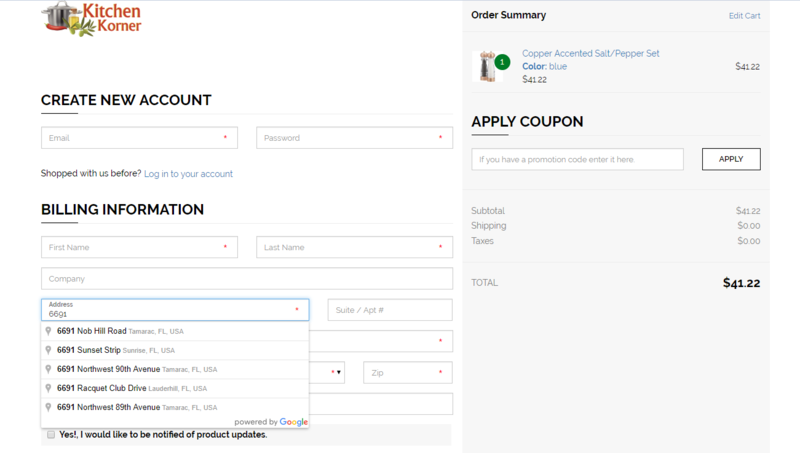 Additionally, Version 9 introduces important upgrades to help protect your online store from being flagged as a spammer — plus, enhancements to the Promotions Manager to allow the creation of coupon codes that you can email directly to customers. 3dcart Version 9 includes new built-in functionality. Our new Carrier Delivery Notifications comprise two new automatic emails available for merchants (on the Pro plan and higher). The first of these emails can be sent to customers when their order is out for delivery — i.e. the final leg of the fulfillment journey from the local carrier to the destination. 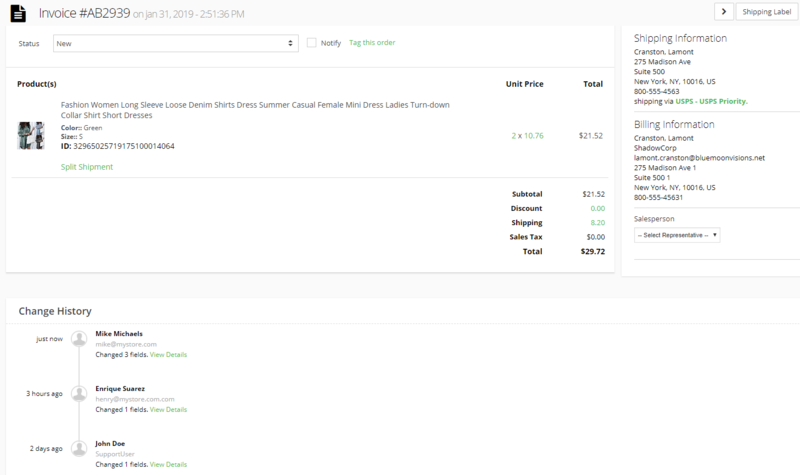 The second email is a delivery confirmation to be automatically sent when the order is marked by the carrier as delivered. These two new automatic emails will help keep customers better informed about their order status, cutting down on support requests to your store and improving customer satisfaction. AliExpress is an online marketplace owned by Alibaba and composed of thousands of small businesses in China making their products available to international buyers. Many Chinese manufacturers sell on AliExpress, offering products at low prices with no retail markup. 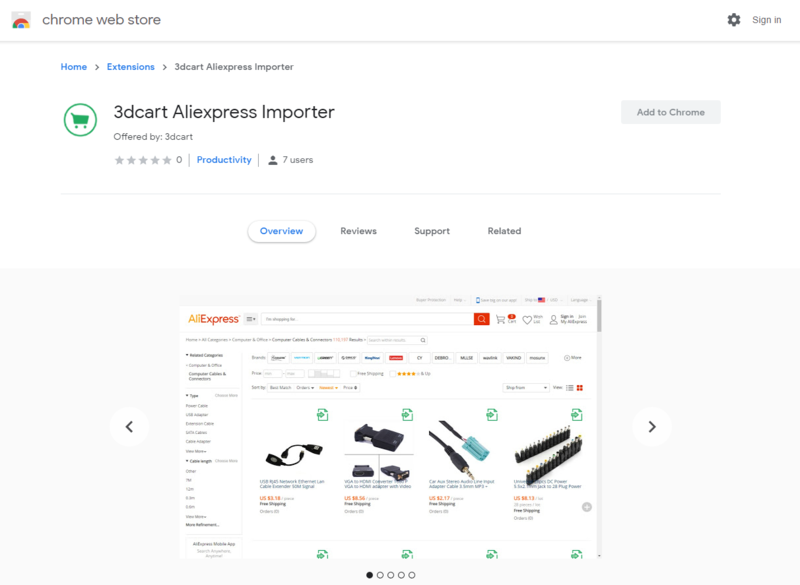 3dcart store owners who source products from AliExpress via dropshipping will find this process easier with the new 3dcart AliExpress Importer extension for Google Chrome. The 3dcart AliExpress Importer helps you find products on AliExpress that you can start selling right away, without needing to hold any inventory yourself. With the 3dcart AliExpress Importer, you can easily add products from AliExpress to your 3dcart store, including product information and images. Once you receive an order, you can export it to AliExpress complete with the customer's shipping information. AliExpress will then fulfill the order directly and you will keep the difference between the AliExpress price and the pricing you used on your 3dcart store, all without needing to buy inventory or ship products. We have completely redesigned the 3dcart File Manager to provide an enhanced user experience while uploading product photos in your online store. This redesign includes an overhaul of the Image Upload feature to ensure that adding product photos to your store is fast and seamless. We all know anything that smooths the checkout experience for the customer is a great benefit; all measures taken to reduce checkout friction help reduce cart abandonment and increase your conversions. In Version 9, we're adding a new module to integrate Google Address Autocomplete into the checkout. As customers start typing the Google API automatically fetches and displays the matching addresses. In Version 9, we've added a new activity log to the Online Store Manager that will display the complete history of all changes that have been made by Staff Users to orders, customers, and products. This log will help you identify when changes were made to these entries, and by whom. 3dcart Version 9 brings you more control over how you can handle the email server your online store uses to send out newsletters, autoresponders, and more. This update encompasses important upgrades that will help your store avoid being automatically flagged as a sender of spam emails. These new email features are DNS Records Manipulation, email bounceback management, and DKIM signatures. DNS Records Manipulation is a new interface in the Online Store Manager in which you can add or edit the TXT and MX records for your 3dcart domain. In a basic sense, these settings allow you to choose where to receive the emails sent to your store and to verify that the emails you send out are genuinely coming from your own domain name. To further prevent the misidentification of your store's outgoing emails as spam, 3dcart Version 9 also introduces email bounceback management and DKIM signatures. 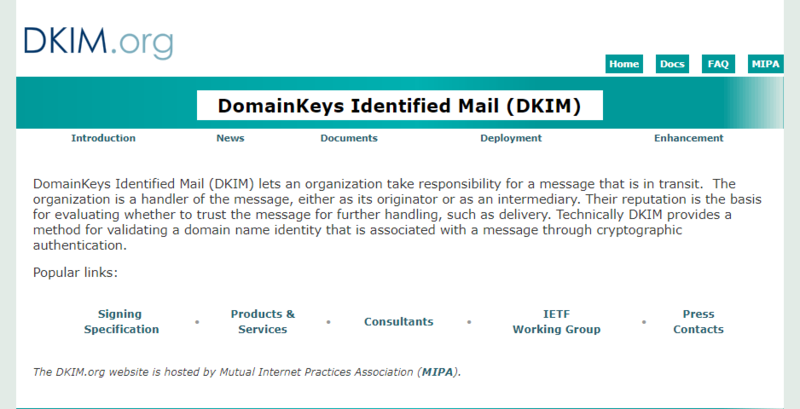 The DKIM (Domain Key Identified Mail) signature is a type of TXT record that adds an encrypted key that acts as a "fingerprint" to confirm to the receiving email server that the sender of an email is genuine. In addition to using the DKIM to verify you as the email sender. 3dcart's email bounceback management will prevent your store from sending emails to addresses that no longer function. Spammers often send thousands of emails to large lists that can include tons of old, nonfunctional email addresses, so anyone that repeatedly sends emails to dead addresses runs the risk of looking like a spammer. The new email bounceback management works by analyzing any hard bounceback messages and blacklisting the relevant email addresses to avoid emailing them further. We are confident that these features will vastly reduce the chances of your store being flagged as a spammer. In Version 9 we've taken steps to make it much easier for payment providers to integrate with 3dcart via our new payments API. The availability of the payments API means payment providers can develop their own integrations with 3dcart , which will add the payment gateway to the available options for 3dcart stores with the created app enabled. If you want to build a payment gateway, then you'll need to be granted access first. To request access, contact us via our developer portal. Autoship is a useful 3dcart module for setting up a subscription-based business or an auto-delivery of products . 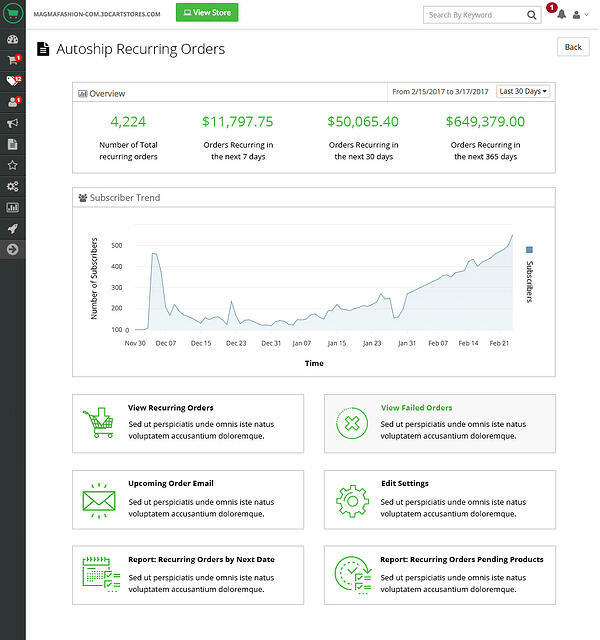 Autoship lets you offer your customers the option to sign up for automatic billing and reordering of applicable products on a regular basis. In 3dcart Version 9, we've brought several improvements to Autoship. 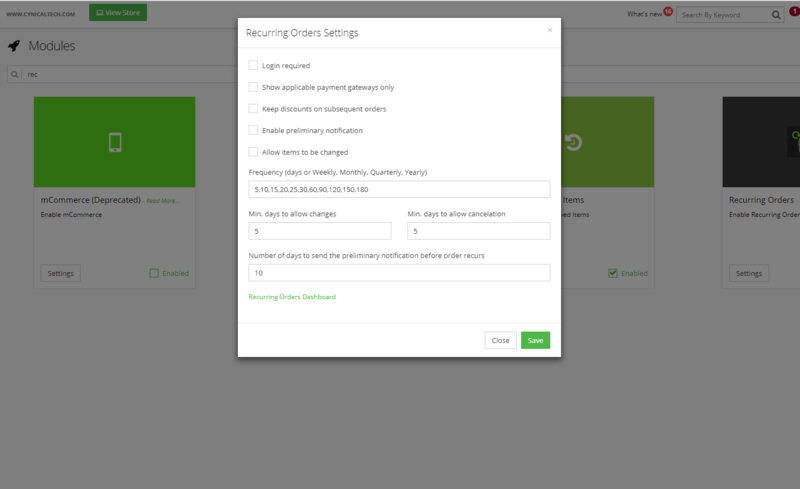 Starting with Version 9, you can also offer subscriptions with Monthly, Quarterly, and Yearly recurrence settings. We've also added a new setting to specify the number of times the order will recur, allowing for the creation of an end date for subscriptions. Customers will have additional options available for managing their subscriptions as well. Rounding out these upgrades, we've introduced a new reporting dashboard to help you understand the data centering on your subscription sales. ShareASale is an affiliate marketing network that's been in business since 2000. Merchants can sign up for ShareASale to make their products available for promotion by ShareASale affiliates. Affiliates use ShareASale to find products to promote and earn commissions. 3dcart's new integration makes it easier to run an affiliate program through ShareASale by automatically enabling a conversion script for the merchant. Based on the feedback from store owners via our Uservoice portal, we're introducing a new method for sending exciting promotions out to your customers with an improvement on the Promotions module. This enhanced feature allows you to create your promotion coupon code as a link that can be sent directly to your customers. This makes it much easier and more convenient for your customers to use your promotions, as they'll be able to click the link instead of manually entering a coupon code. This convenience reduces friction and makes it more likely for customers to engage with your promotions. 3dcart Version 9 improves the functionality of Waiting Lists for both merchants and customers. New settings have been added to allow merchants to export waiting lists in a similar way to 3dcart's other data exports. Plus, customers will be able to view and manage their Waiting List items in their My Account page on your store. With 3dcart Version 9, a new setting is available in the Phone Orders module to allow you to use Address Verification service within the control panel. This feature is rolling out first to the new beta version of the Phone Orders module. To round out our enhancements in 3dcart Version 9, we've improved upon several existing integrations with payment gateways. Our Square POS integration has been updated to use Square's Webhooks as a fallback to process missed orders. The Stripe integration has been upgraded to enable its use on Phone Orders and Virtual Terminal. Similarly, PayPal Braintree has been updated to use the new API to enable its use on the Virtual Terminal as well, along with a couple other enhancements: the 3dcart Braintree integration is now compatible with Braintree's fraud protection through Kount, and customers no longer need to add a zip code to the payment section while checking out. Google Pay has been updated to use Google's Platform Authentication and API 2.0, smoothing the integration process by removing the need to enter credentials in the 3dcart Online Store Manager to add Google Pay to your store. Finally, the eWay payment has been updated to smooth their transition to AWS (Amazon Web Services). Version 9 introduces some new payment gateways to 3dcart, including Paynamics, a flexible payment provider with international capabilities, fraud prevention, and a subscription engine. Integration with Sezzle Pay has also been added to help you provide your customers with this popular and powerful Buy Now, Pay Later option. 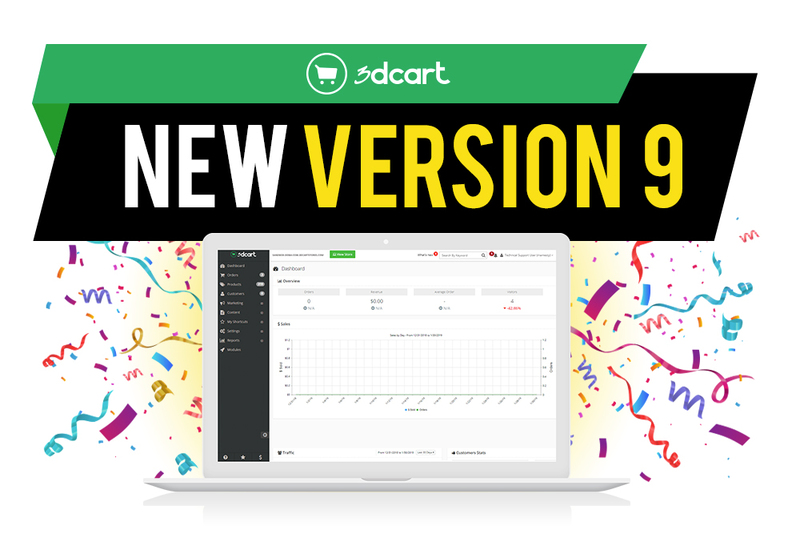 3dcart Version 9 is coming soon to all 3dcart stores, and you won't need to do anything to access the updates — they'll be applied automatically to your store during the rollout period. We'll keep you posted with release dates, so stay tuned!